North Highland College UHI Mechanical Engineering Curriculum Leader, Peter Hylton, visited the schools beforehand to give a presentation on the World Land Speed Record (WLSR) and various engineering approaches used on the cars that have broken the record. The schools then had two weeks to design and build their cars from materials provided by College with the help of the Energy Skills Partnership. Pupils were provided with a block of foam, two axles and four wheels, and two hooks for the safety tether, from this they shaped the cars under the guidance of their teachers. Chris Aitken, Computing Science Teacher from Wick High School said; "We always look for practical opportunities to bring coding to life and combining the rocket car with the micro bit was a fantastic opportunity for us." Principal of North Highland College UHI, Donald MacBeath said "I think the Bloodhound Challenge presented an excellent opportunity for the young people to test their research, design and engineering skills in a highly competitive situation. I would like to congratulate all the pupils who responded to the challenge so positively and the college and school staff who worked together to provide this inspirational learning experience." 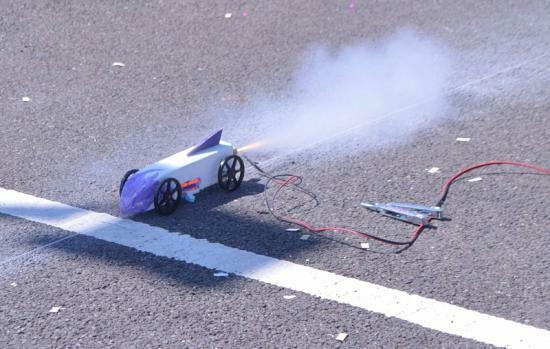 College staff took the cars, installed rocket motors and prepared and launched the cars along a taught wire, while students observed from a safe distance. Their times were recorded as they passed through a timing gate and the speeds were calculated from those times. Thurso High were first to launch their cars, with one car taking the clear lead. The bar had been set and the friendly competition started with Wick and Golspie High Schools cars launching next. However, it was the second last car of the day and a group from Tain Royal Academy who took the top spot, with a speed of 75 kilometres per hour. The all girl group were Alanna Shaw, Chloe Mackay, Molly Mackay and Aimee Milne. The turn out on the day was fantastic with 33 teams entering. The results at North Highland College UHI will be compared against other Scottish schools and the top teams from across Scotland will be invited to compete in a final event at the Glasgow Science Centre on 9 June 2016. Students at North Highland College UHI enjoyed a series of activities to learn how to better manage their money during Barclays Money Skills Week. The interactive events covered themes such as budgeting, saving and spending, and were designed to be entertaining and informative.